I love noodles of any kind but growing up there was one noodle dish in Korean cuisine I couldn't wrap my mind (stomach?) around and that's kongguksu. I'm not alone when I describe it as a polarizing dish. Even amid the pantheon of Korean noodle dishes it stands quite apart being neither fiery, meaty or tart. Literally translating as "bean noodles", the milky-white bowl of cold noodles comes from its creamy milky soup that's made from ground soybeans. Even based on its description it's a dish that's hard to imagine for those who haven't tried it and even for those who have, it's not a dish that most instantly falls in love with. But as I've grown kongguksu too has grown on me. I've even found myself sometimes having a hankering for it. In summertime it's pretty easily found from kimbap shops to even Chinese restaurants but the quality differs from place to place. Among locals though, probably the most famed kongguksu in all of Seoul if not Korea itself is found in a shop by Seoul City Hall and its name is Jinju Hwegwan. Many will swear to you that it's the best there is which is subjective. One thing that's not subjective however is the price. At 10K for a bowl of kongguksu this is quite the mark up from the usual 5 or 6K a bowl price you'll find. Curious, I knew I had to pay a visit. Located in a very historic neighborhood, Jinju Hwegwan began all the way back in 1962 when the original founder, Mr. Jo Geol opened his shop here. Just nearby used to be a famous Pyongyang naengmyeon shop called Gangseo Myeonok which attracted many of the northerners who had come down during the Korean War. Contemplating what they might enjoy, Mr. Jo settled on the humble kongguksu which was originally sold at 90 Won a bowl and which was 10 won more pricier than the naengmyeon next door. Focusing on top ingredients and committed to making the best kongguksu there is, Mr. Jo's kongguksu became a big hit selling up to 3,000 bowls a day- even in its early years! It has since gone on to be featured on numerous TV shows, news, and magazine articles in the past few decades. And inside are the signs and pictures of numerous celebrities, politicians, and famous individuals that have all dined on this humble dish. 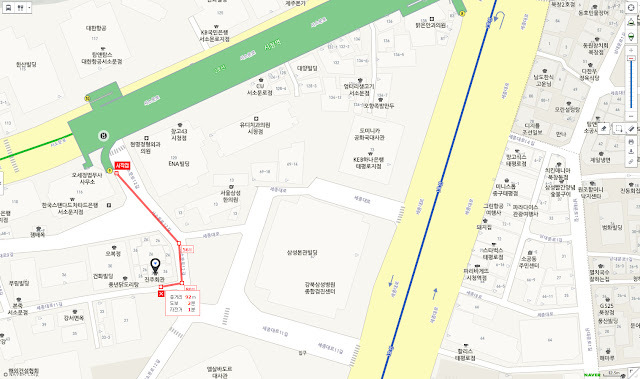 The proximity of the location to city hall and not-too-far-away Cheongwadae has also attracted the big wigs of the country's political past including former President Lee Myung Bak, former Seoul mayor Oh Sehoon and current Seoul mayor Park Wonsoon. It's also famed for having long been a favorite of Samsung chairman Lee Kun Hee. His son, current Samsung Electronics VP Lee Jae Yong was said to drop by frequently as a young kid to ask for a bowl to go for his father. Jinju Hwegwan isn't shy about its pedigree and status which is very proudly on display from the get-go. A very humble but very spacious interior with signs that share how they only use premium gold soybeans from the Gangwon-do region for their kongguksu. 2. The restaurant actually has quite an extensive menu including soup dishes, rice dishes, and even pork and beef for barbecuing. It's especially a bit jarring for initial visits as the prices for the non-kongguksu dishes are pretty standard: 7K for their seokkeo jjigae, kimchi bokkeumbap, kimchi jjigae, and dwenjang jeongol. Their barbecue dishes are pretty reasonable too, especially considering all their pork and beef are non-imports: 12K for samgyeobsal, 26K for sirloin, 20K for beef brisket, and 13K for mushroom and beef bulgogi (all the meat prices are for 200g servings). But 10K for a bowl of kongguksu raises the eyebrows of more than just a few skeptics. And even visually speaking there's nothing that's particularly striking about kongguksu; a mound of noodles sits in a deep pool of the kongguk and is neither colorful or screams to be immediately snapped for Instagram. The only side it comes with is their homemade kimchi which is on the sweeter side. But the humble kongguksu here proves looks aren't everything. First observe the soup which not only has a slight golden hue from the golden soybeans used but is thickkkkkkkkk. Take a spoon and scoop some up to notice the difference of the almost milkshake-like consistency here which is quite different than other kongguksus that are much more watered down. And just when the subtle textural differences have begone to pique your interest the first bite is when it'll really surprise you. At first the creamy taste will almost have you thinking the soup is milk-based. But then the slightly nutty aroma of the gold soybeans will make it clear this is kongguksu. But that's not where it ends. I'm convinced the secret of Jinju Hwegwan's lies in their special noodles. In any other kongguksu restaurant, the noodles are the simple, thin white flour-based somyeon. As a mainly blank canvas, the two work fine together but if the starch from the cooked noodles haven't been rinsed off enough or if the kongguksu is more water than it is soybean, what you get is a rather bland forced marriage of noodles and bean soup that are simply not getting along. It's the reason why so many restaurants usually provide salt or sugar on the side when you order kongguksu as it takes an extra dash of seasoning to bridge the two together. Now the noodles at Jinju Hwegwan are quite different. Not only are they thicker than somyeon but there's a slight tinge of yellow to it. The reason is because their specially-made noodles are made with not only flour but bean powder and potato starch. Flavor-wise this not only adds a nutty element to the noodles itself to pair so well with the rich soup but the noodle's chewy consistency brings an extra dimension to the dish as a whole with every chew. And just when it's getting just borderline rich is when the kimchi cuts in. I was wondering why the kimchi was a bit sweeter than other places but the bit of sweetness brings the contrasting sharpness of the kimchi and nuttiness together. There's kongguksu and then there's kongguksu from Jinju Hwegwan. They really have put thought into each and every component of the humble dish. Despite its initial underwhelming appearance, it's a dish which, if you put a bit of contemplation while eating, you'll see there are subtle layers to it that proves fun to uncover. That being said, I don't know if I can justify having it so frequently at its price. But it is definitely worth trying a few times such as once or twice during the summer season or at least to really show you what kongguksu is. Come out exit 9 of City Hall station, walk straight on Seosomunro 12-gil for about 150 meters and turn right on Sejongdaero 11-gil and you'll almost immediately see it. Free parking the first 30 minutes in the lot right in front of the restaurant. Apparently the original owner and founder of Jinju Hwegwan passed on the original store to his firstborn who has been running it since while the second son opened an offshoot called "Jinju Jib" in Yeouido. I haven't tried the offshoot store in Yeouido but it certainly has its legion of fans! There's also a groupie for the "seokkeo jjigae" (literally "mixed jjigae") at Jinju Hwegwan too. Similar to budae jjigae (army base stew), this version has the standard sausage, ramen noodles, veggies in red broth but also with squid and udon noodles.